They are from The Glacier Distilling Company in Coram, Montana , they – according to their website – “specialize in small-batch whiskeys that reflect the rugged beauty of our surroundings. We use local grains and pure glacial water from the Northern Rockies to create alpine whiskeys best enjoyed in the great outdoors.” . 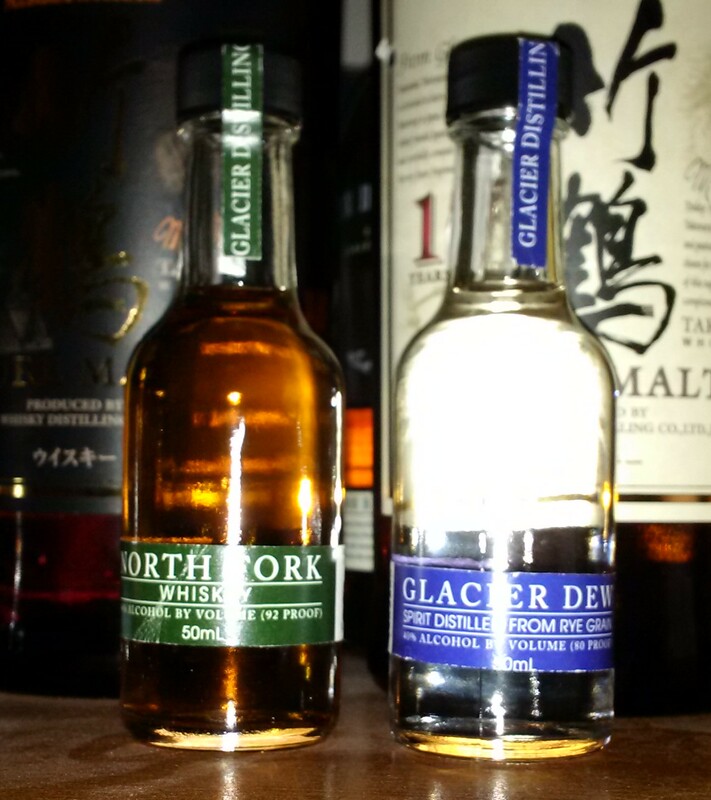 The two he gave me to try are the Glacier Dew and North Fork Whiskey . This is bottled at 40% and according to the label from Batch 6 , it is distilled from rye, barley and corn and is minimally aged , hence how clear it is . The nose is very ‘New Make’ but you do get the corn and rye in the background . The palate quite relaxed but again the new make dominates but there is a generous hint of Rye , the finish is remarkably short but but burning . Not a huge fan of this young an age whiskey but it’s a lot more drinkable than some stuff i’ve tried . I would imagine this would be better with a mixer but would you lose the nice Ryeness of it ? Bottled at the higher ABV of 46% , it is from Batch 7 , Again distilled from Rye, Corn and Barley , this one is a lovely Amber colour . The first thing that strikes you on the nose is the Rye , there’s also a hint of youthfulness to it but nowhere near the Glacier Dew , Buttercotch Toffee , Vanilla and Spices . The palate shows more youthfullness than the nose but by god the Rye bursts through , Black pepper , cloves , a slight matiness but bags of rye . It has a medium finish with the spices , rye and spirit wrestling each other . Not a bad wee dram but it could do with a bit more maturing for my liking .